Facebook hasn’t come to the iPad with their own version of an optimized app yet. But sobees for Facebook is here and it’s amazingly cool and better yet, its free. Sobees for Facebook is a virtual newspaper maker type iPad app that presents your Facebook profile, status updates and wall posts to you in a very usable way on the iPad. If you use apps like The Early Edition this one will feel very similar in its interface. Sobees gives your large iPad real estate what it can handle with a nicely thought out and designed interface. 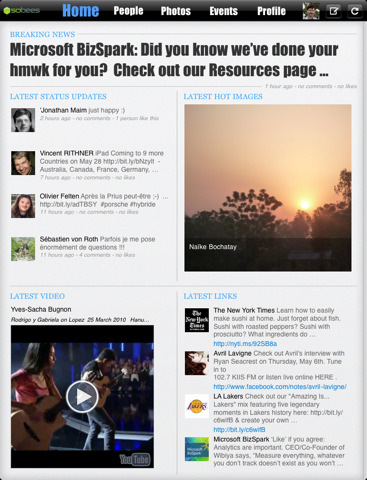 The Home tab: On the left you see the latest status updates from your friends and their icons. In the middle a giant block of text shows the “breaking news” from the most recent post. Under that a perfectly fitted photo uploaded recently from a friend of yours is presented. Finally on the right side the latest link posts and video upload/posts are shown which you can promptly view/play using the iPad YouTube player. The people tab is a gallery style layout of all your peeps. Tap on anyone to show their profile or save their profile photo. Their profile view is very clean – like everything else in Sobees for FB – think Facebook without all the ads. The photos tab is reminisant of the iPhoto app in the iPad. Here you see piles of photos as albums that you can tap on to view. Flip back and forth using swipe, but no slideshow support here unfortunately. The Events tab is a calendar format layout and shows lists of things going on in your FB profile including gatherings you’re attending and upcoming birthdays. Finally the profile tab takes you to your own profile. You can’t edit your profile info from here. Posting from Sobees is limited. You can basically only enter text based status updates. Links in the Sobees for Facebook app open in its integrated web browser. Overall, Sobees for Facebook is one of those free apps that you’ve got to get and try for yourself. If you have and use Facebook, you will most likely love its unique format and get a kick out of how much fun FB can actually be without all those pesky ads and tiny font sizes. The interactive nature of Facebook isn’t present like chatting, replying and posting on walls, but that’s also part what makes Sobees great. Just relax, kick up your feet and read your very own morning Facebook paper. Now hopefully this will influence Facebook to get their act in gear and get an official iPad app out soon. AppSafari review of Sobees for Facebook was written by Joe Seifi on May 13th, 2010 and categorized under App Store, Chat, Featured, iPad apps, Social. Page viewed 4078 times, 2 so far today. Need help on using these apps? Please read the Help Page.